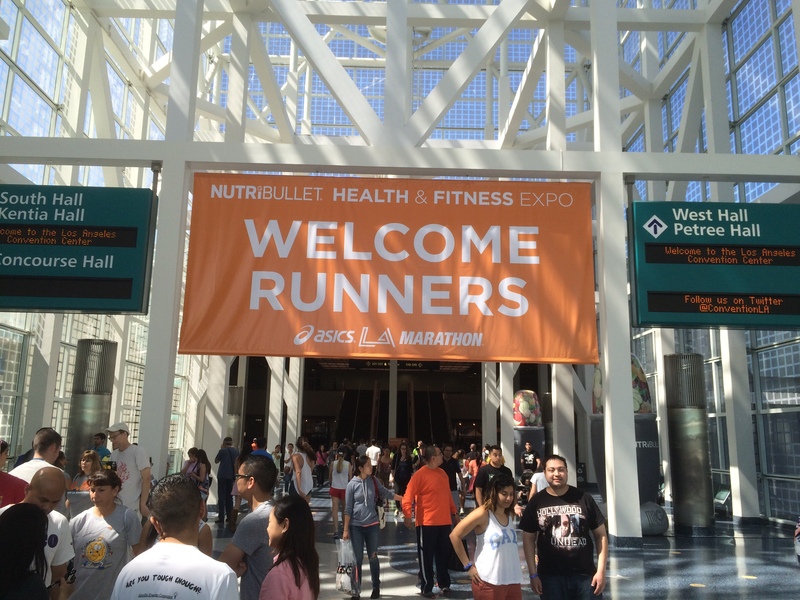 The 2015 Asics Los Angeles Marathon began with the NitriBullet Health and Fitness Expo at the Los Angeles Convention Center. The Expo took place on the Friday and Saturday before the marathon. On Friday, I had to work. So, I went to the Expo on Saturday. Next year, I plan on changing that. Friday was such a difficult day to be at work. 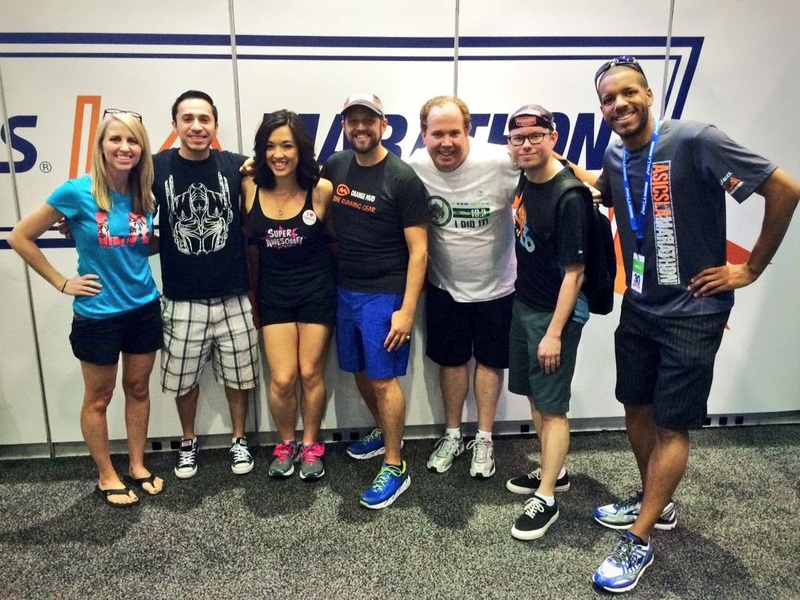 As I saw various running friends at the Expo, my mind was not focused at work as much. 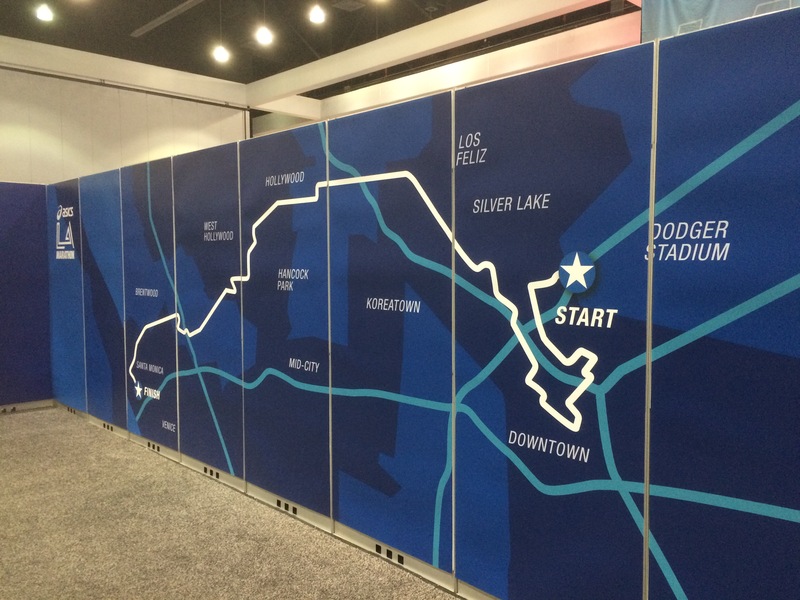 Plus, next year (2016), the United States Olympic Marathon trials will be held on the Saturday before the actual Los Angeles Marathon. So, a Friday attendance of the Expo is a must. This Expo is larger than the Expos I have usually attended. 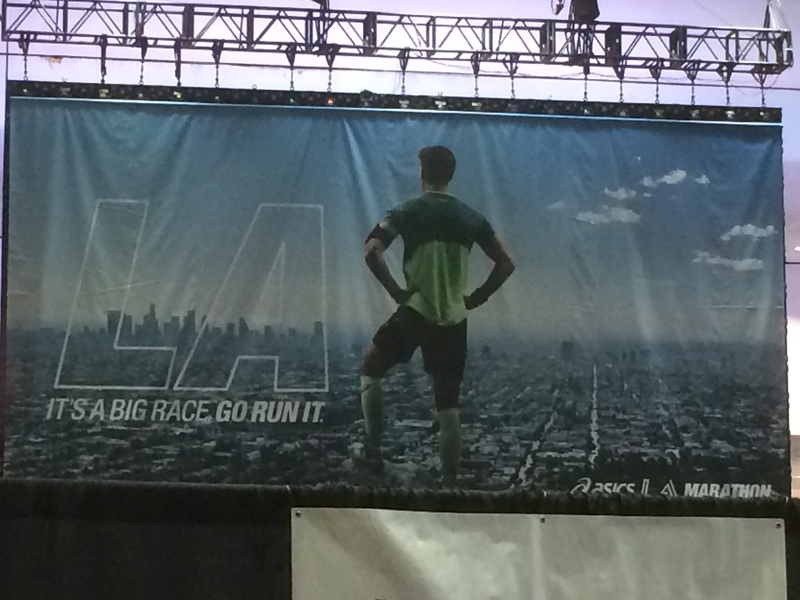 It’s even larger than the Rock n Roll Los Angeles Half Marathon Expo held in the same location. As you can see, there were lots of people out and about for this one. 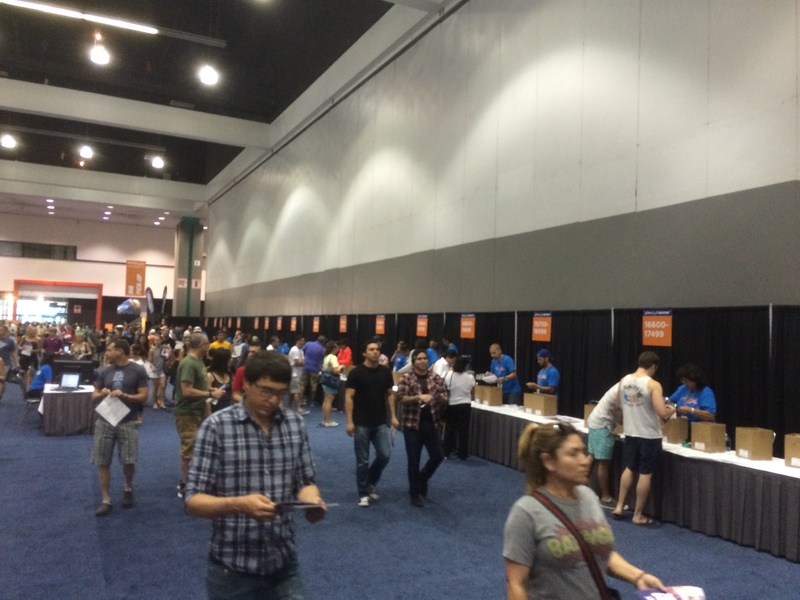 There was no line for me to get my race bib. So, I was in and out of that part really quickly. After getting my bib, they wanted me to walk across a timing mat to make sure all my information was showing up correctly in the computer. A little further up the initial walk way was where you got the rest of your race gear. Again, no line for me! 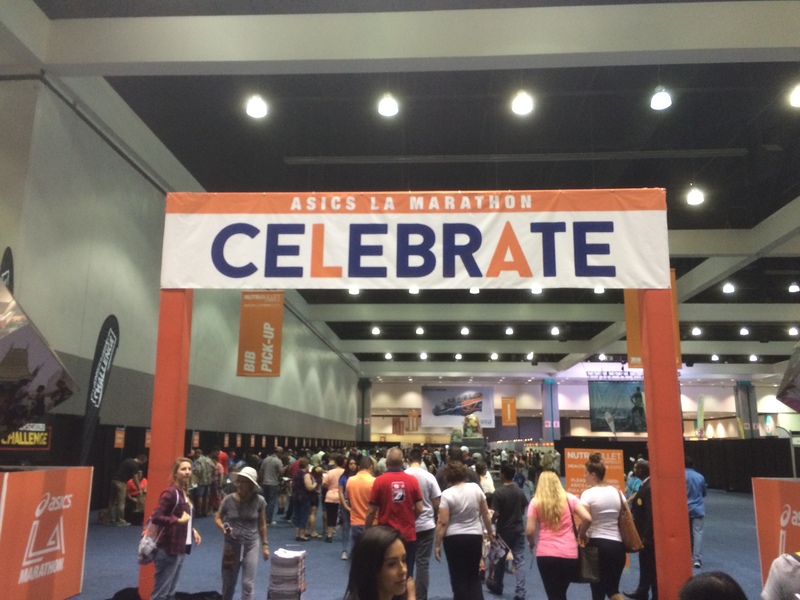 Before I knew it, I had my race shirt and bib and was in the official Asics booth for the Expo. They had a DJ in the booth! 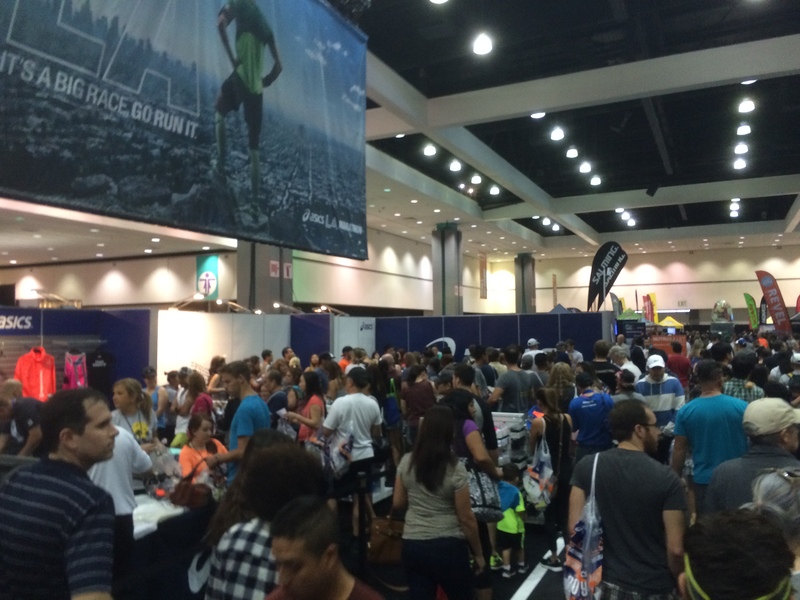 The Asics booth was really busy as you can see in this picture. It was hard to stop and look around too much. I thought it was cool that they had mannequins to display some of the merchandise being sold. 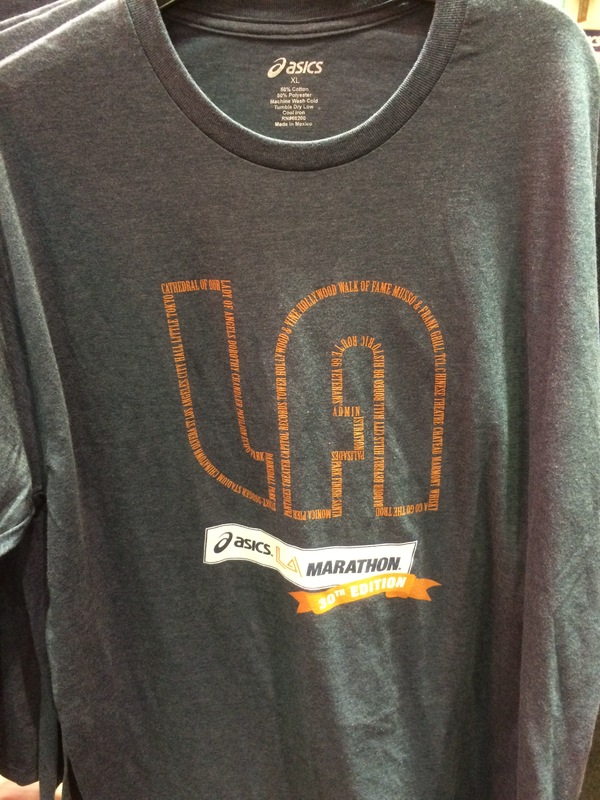 Of the official Los Angeles Marathon merchandise I saw, this shirt was the most tempting to purchase. Sadly, they didn’t have my size available. So, the temptation wasn’t too great. I have never purchased a piece of merchandise at any non-Disney race that I’ve been in and that streak continues. The shirts I liked, like the above shirt, were not available in my size. 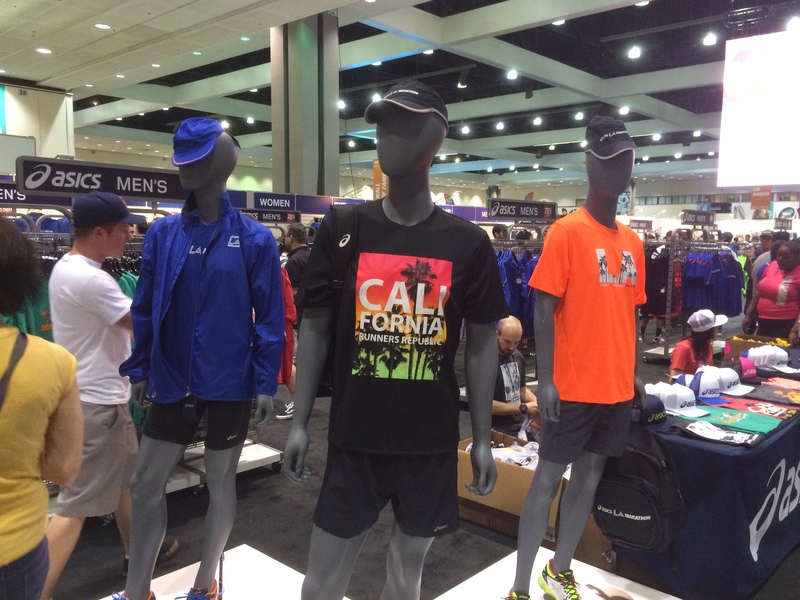 Most of the merchandise available in the Asics booth was not LA Marathon specific. 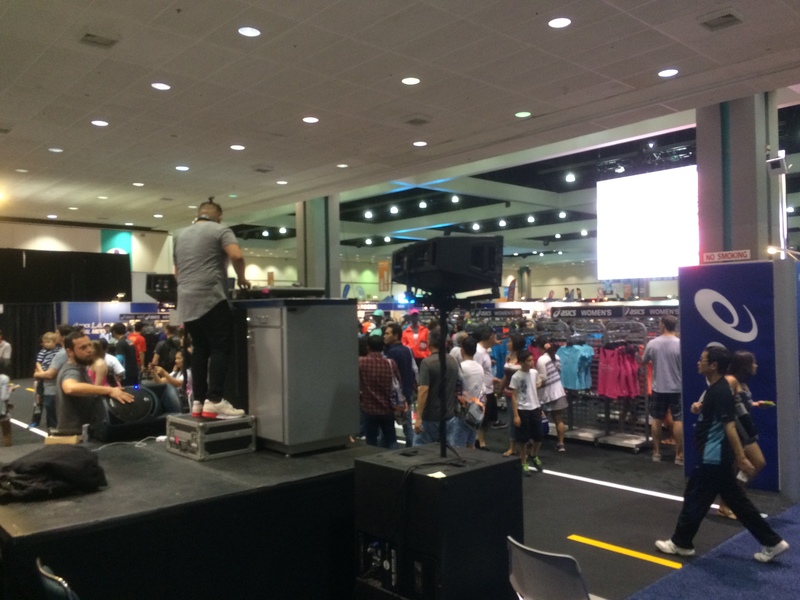 So, even though the booth was rather large, as a Brooks runner, it was easy to pass through without purchasing anything. 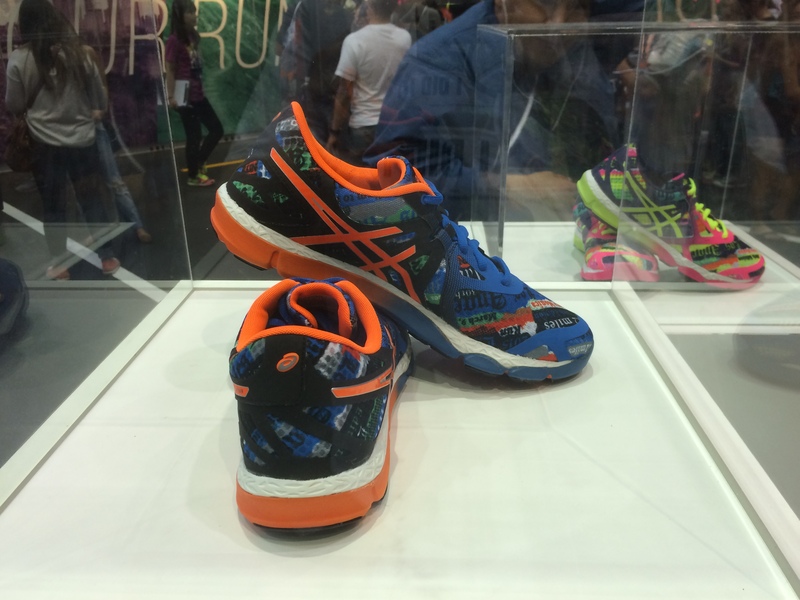 Just to show that New Balance runDisney shoes aren’t a unique phenomenon, here are the official Asics LA Marathon shoes for men. 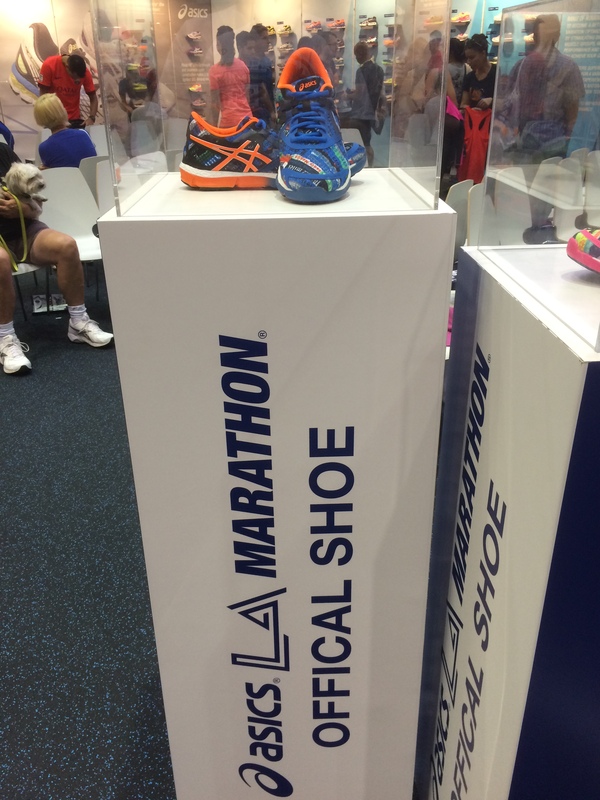 You can see in the distance the women’s official shoe. I tried to get a more close up shot of the women’s shoe. 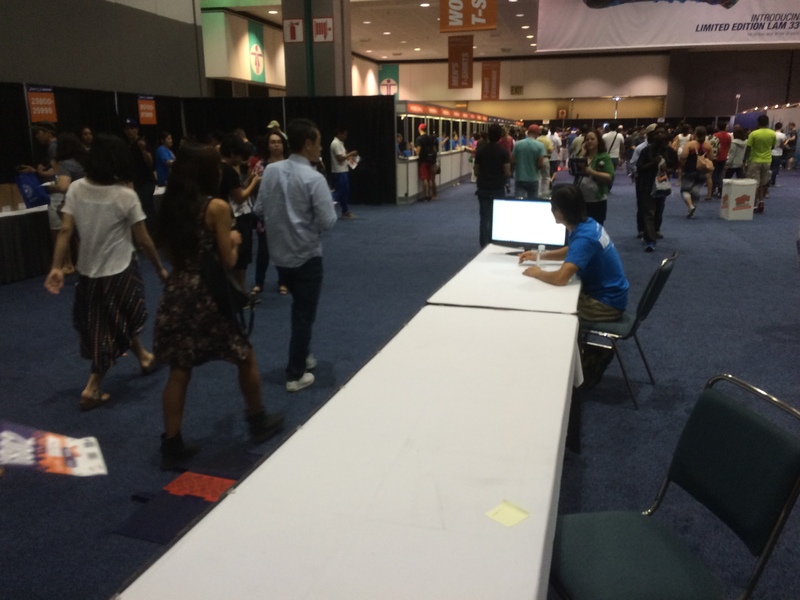 However, the booth was just too crowded. Once I got out of the official Asics booth, I ran into fellow runDisney fan AJ and Ivie. While we chatted, one of their friends found them as well and we got this picture. 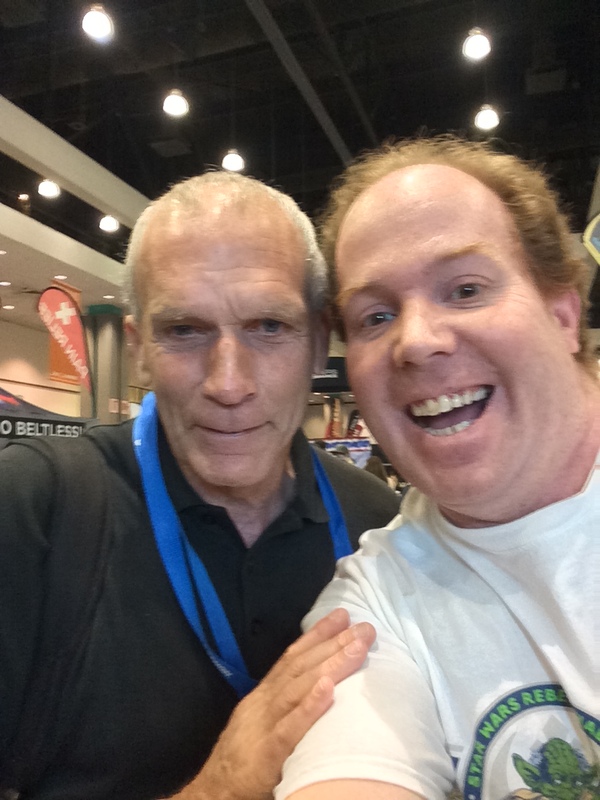 I first met AJ in the starting corrals of the 2014 OC Half Marathon. He’s apart of a Jeff Galloway running group in Long Beach (which is what sparked our first conversation). He and Ivie are really cool people. 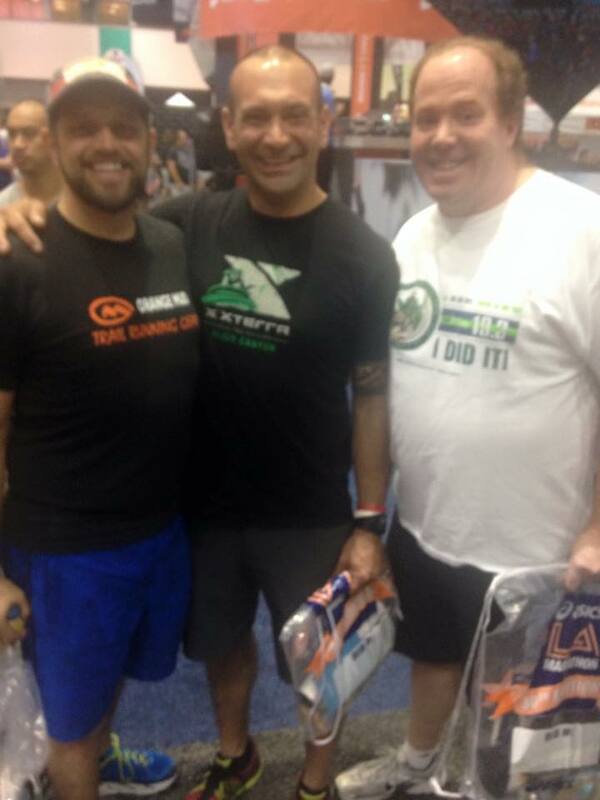 So, it was great to run into them at the Expo. AJ wasn’t running the marathon, but Ivie was. Yasso joined Runner’s World in 1987 to develop the groundbreaking Runner’s World Race Sponsorship Program, creating a vehicle for Runner’s World to work with over 7,000 races representing 4 million runners per year. Inducted into the Running USA Hall of Champions. Yasso also invented the Yasso 800s, a marathon-training schedule used by thousands around the world. He is one of the few people to have completed races on all seven continents from the Antarctica marathon to the Mt. Kilimanjaro marathon. In 1987, Yasso won the U.S. National Biathlon Long Course Championship and won the Smoky Mountain Marathon in 1998. He has also completed the Ironman five times and the Badwater 146 through Death Valley. He has also cycled, unsupported and by himself, across the country twice. My favorite part of this video is where he talks about leaving the watch at home for the race. He said that he knew some runners would be a little worried about doing that because they couldn’t post to Facebook their finish time right away. To that, he said that he had run over 100 marathons before Facebook or Twitter were invented and he survived okay. So, we could leave the watches at home. I had to leave Bart’s talk a little early for a Tweet-up that was hosted by Linzie of Sharp Endurance. Ivie and AJ were also there and I got to meet some new peeps. It’s always fun when runners get together. 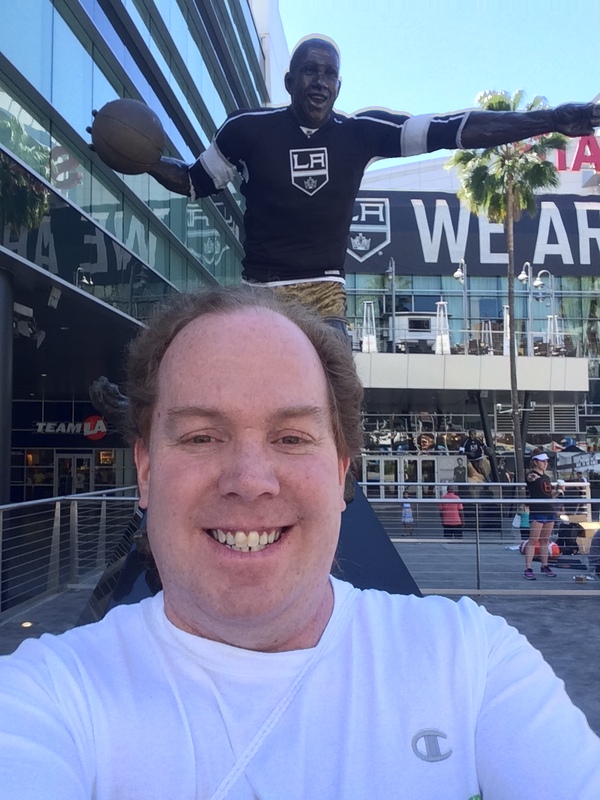 If you haven’t visited Linzie’s blog yet, you should. He’s an awesome person who is chasing some pretty big goals. Check out Sharp Endurance. After the Tweet-up, it was time to finally check out the Expo floor and see what was there. 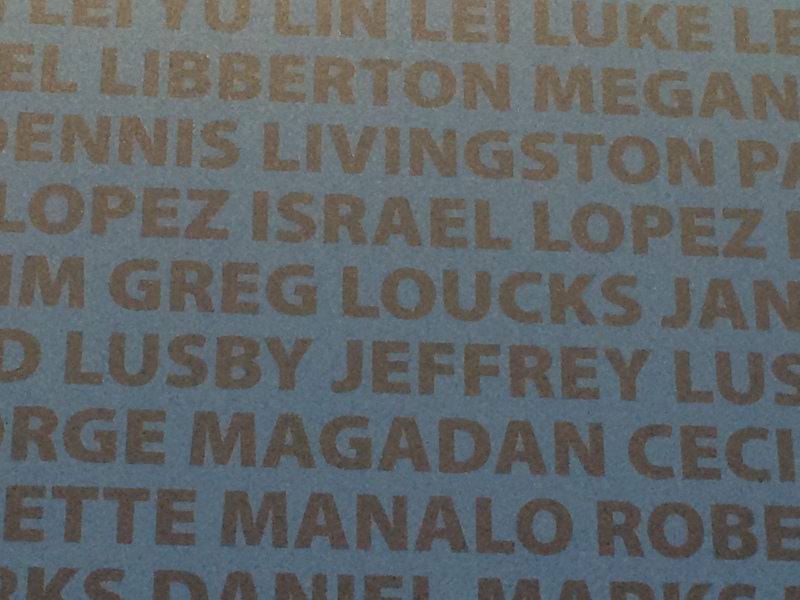 One cool thing I saw was this huge wall that had all of the marathon runners names on it. I had to spend time to find my name. Right? There it was! I also took the time to find the names of others who I knew were running. Another thing on my agenda was to purchase a new pair of Pro Compression socks. As luck would have it, Linzie was working the Pro Compression booth and sold me these lovely blue Pro Compression socks (which were on sale!). I already have a white pair which were miracle workers after the Walt Disney World Marathon. This time around, I planned on changing into one pair of Pro Compression socks before heading home and another after getting cleaned up. So, I needed an extra pair. Mission accomplished! After purchasing Pro Compression socks, the next item on the agenda was lunch. 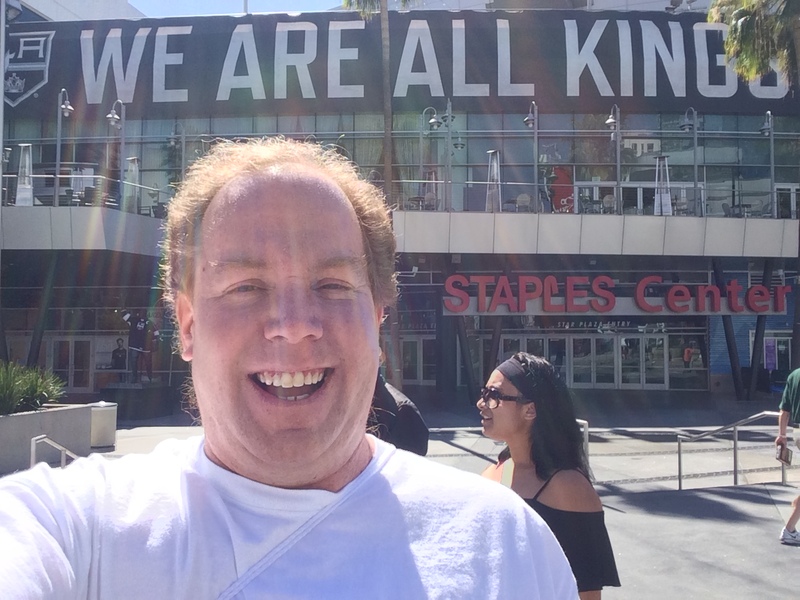 So, I headed over to the LA Live to grab a bite to eat. On the way, I walked by Staples Center (right next to the LA Convention Center). They were getting ready for a hockey game. 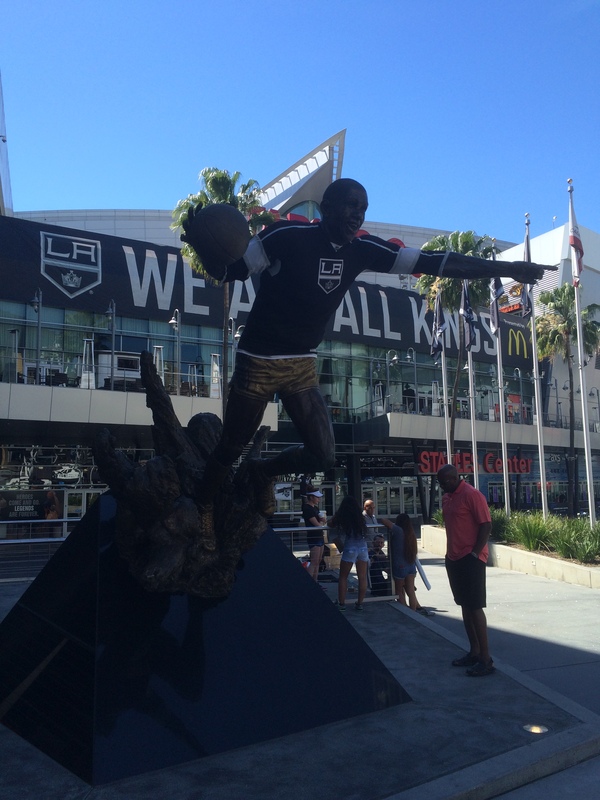 Part of that involves dressing the statues in Kings gear. I’m not too sure how I feel about Magic Johnson in a Kings jersey. However, I did manage this selfie. 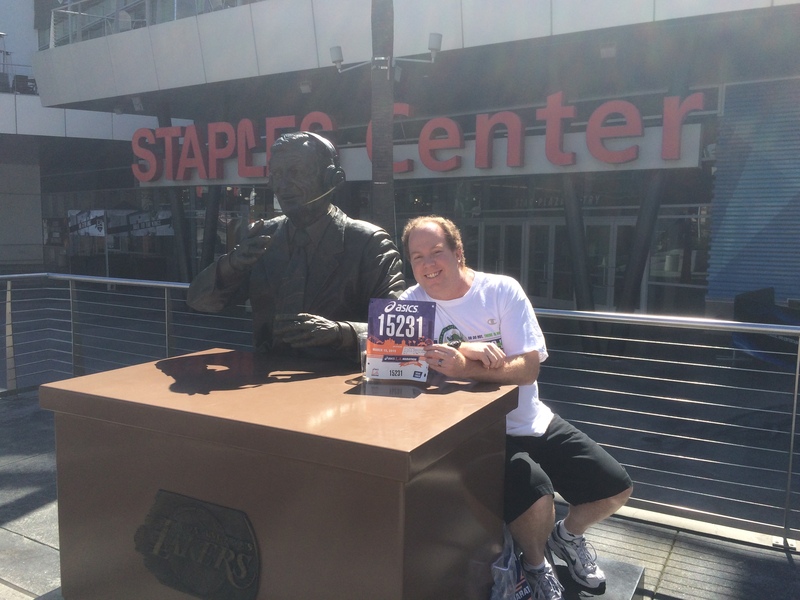 Fortunately, they didn’t dress up Lakers commentator and hall of famer, Chick Hearn. We chatted up race strategy for a bit. I love this picture…We Are All Kings! Great message to keep in mind while running a marathon! After lunch, I headed back into the Expo. I took a few more pictures. Here is the marathon course route! You’ve got to love all the cool signs at Expos! 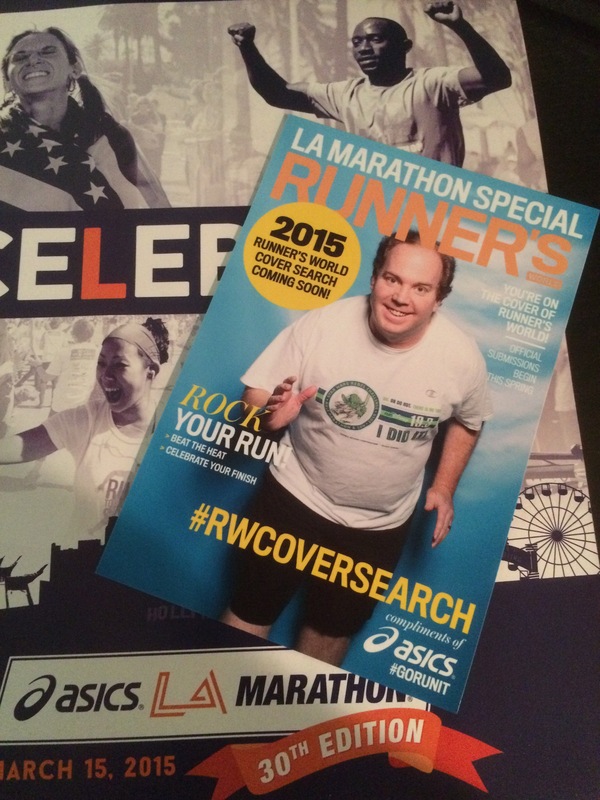 LA It’s a Big Race…Go Run It! 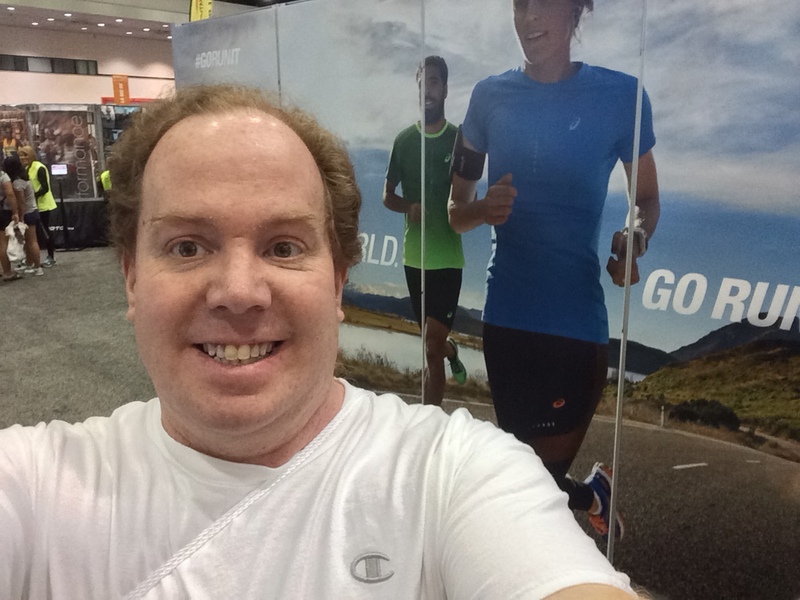 At the Runners World booth, they were taking these fun pictures! I got a free digital copy as well as the print! 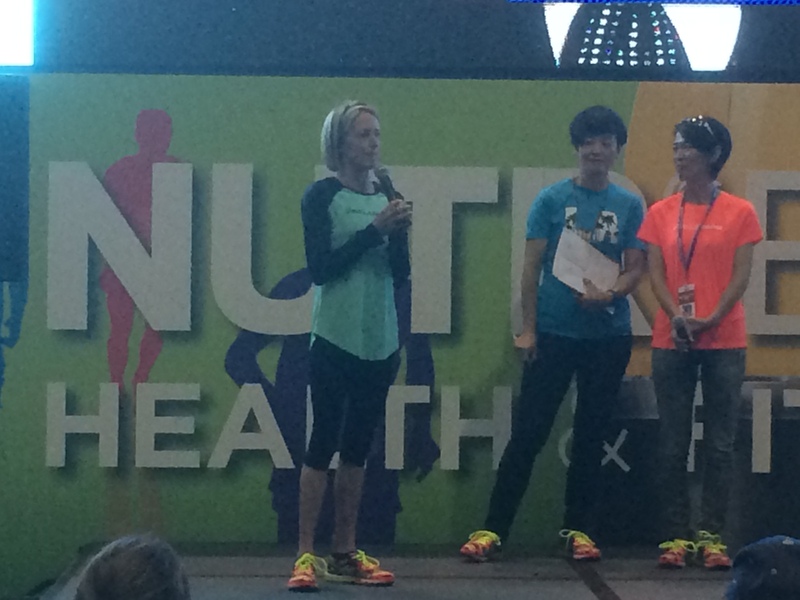 Next up was taking in the Q & A with Deena Kastor and Yuko Arimoni. It was interesting to hear from both of these elite runners on a wide range of topics. I really liked the story Deena told about how she chose her first real running shoes. After college, when she realized that she was going to be more serious about distance running, it dawned on her that she needed a real set of running shoes. So, she went to a local running store to find some. She told the sales person that she was going to buy shoes that day. However, she wanted to try on every shoe they had first. One pair of Asics fit her well and she’s been running in Asics ever since. The thing on everyone’s minds was how to deal with the heat. The above video is what Deena and Yuko had to say about that topic on this particular course. One thing that I was not a fan of at the Expo was that the speakers were put on a stage under this huge video board. It mad photographs and videos of the speakers not turn out very well. All that light put the speakers in darkness. During the Q & A, I saw Bart walking from the stage area. I took advantage of an opportunity to ask him about running with my hydration vest. All I can say is that Bart is awesome! He not only answered my question but offered some other advise as well. It’s pretty cool to see someone who is so accomplished willing to help us little people out! It’s because of his words that I decided to ditch the hydration vest. Not too far behind Bart, I saw Rudy Novotny walking. So, took advantage of a chance to chat with him again. Seeing runDisney peeps at non-Disney events is super cool. He also asked about my plans for the race and reassured me that thee would be plenty of hydration on the course. So, I wouldn’t need the hydration vest. 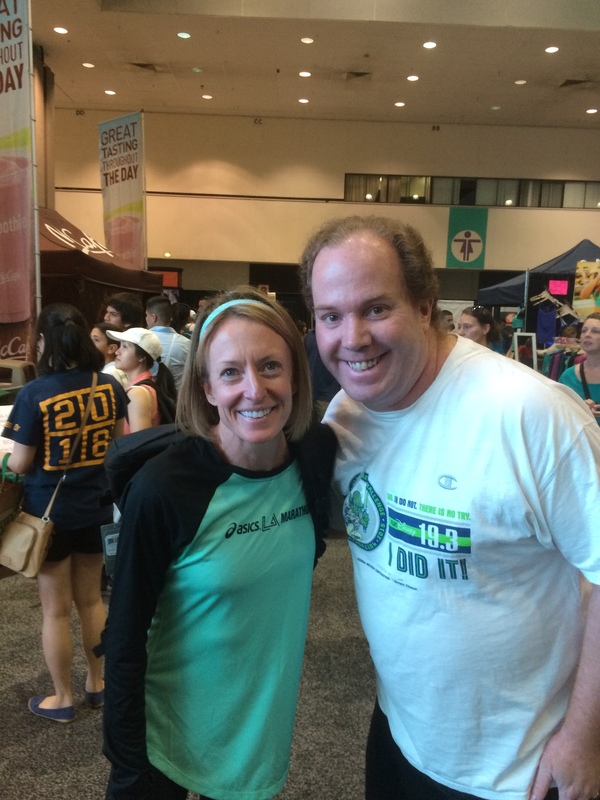 After the Q & A, I saw a line quickly form to meet Deena Kastor and I jumped in. 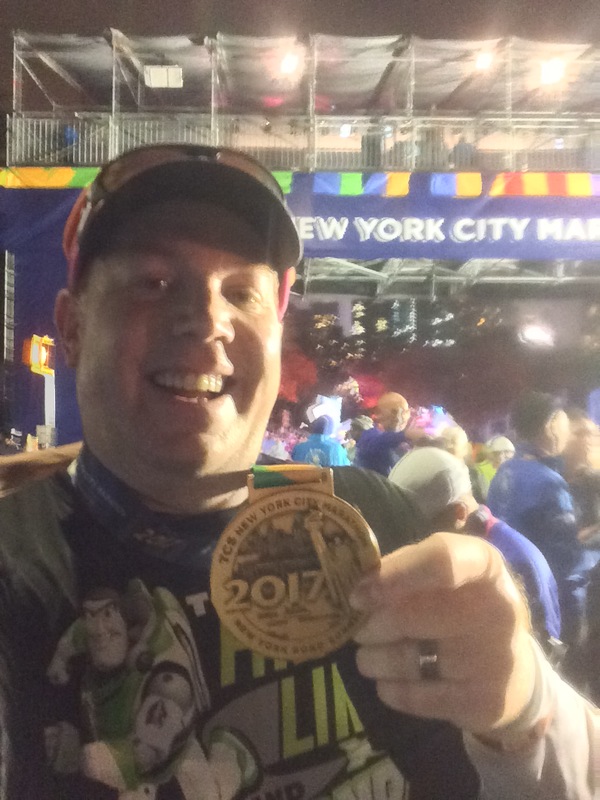 After all, Spirit of the Marathon (which Deena is one of the featured runners) is what inspired me to sign up for the 2014 Walt Disney World Marathon (my first full marathon). It was super cool to get to meet her and her husband. Although the exchange was brief, I was super happy! After meeting Deena Kastor, it was time to head home. 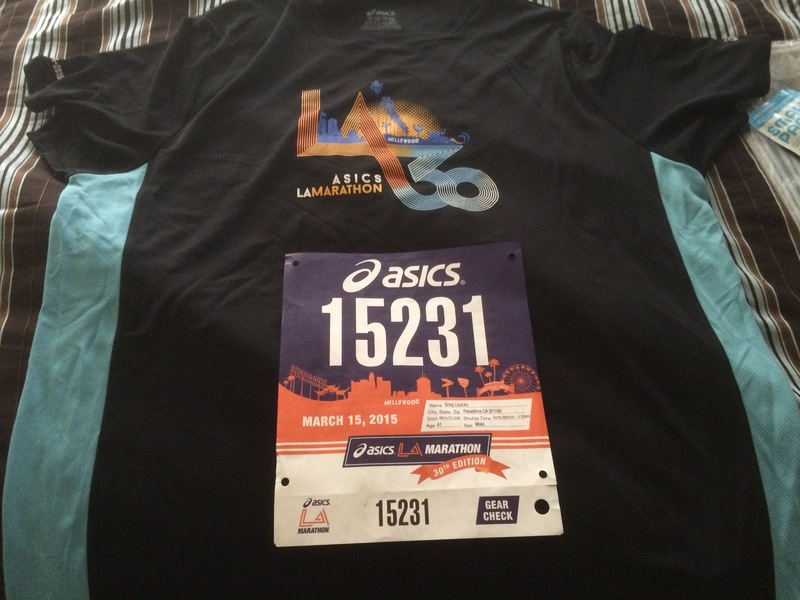 I loved the 2015 Asics Los Angeles Marathon race shirt that we got! Here’s the rest of what I got at the expo. 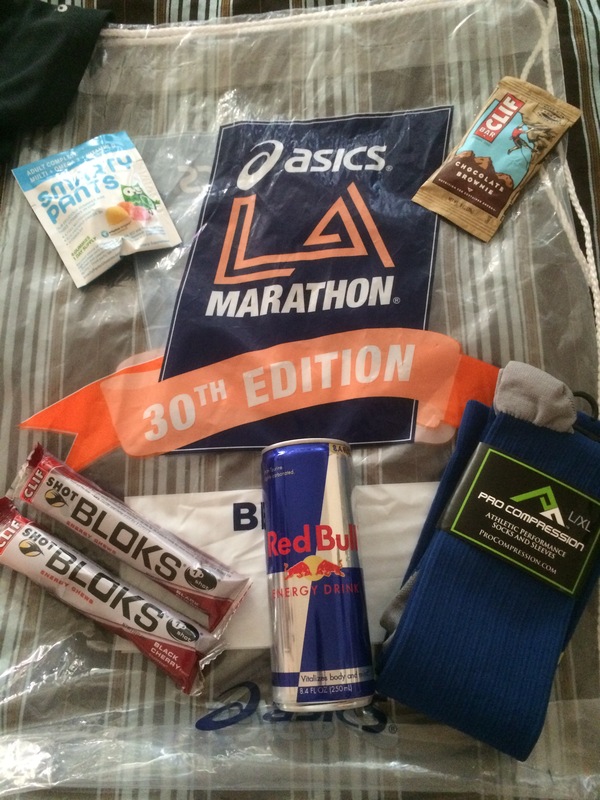 In the bag I got with my race shirt was a can of Red Bull, Chocolate Brownie Cliff Bar (sample size), and Smarty Pants. Of course, there were also some flyers for upcoming races in the bag. 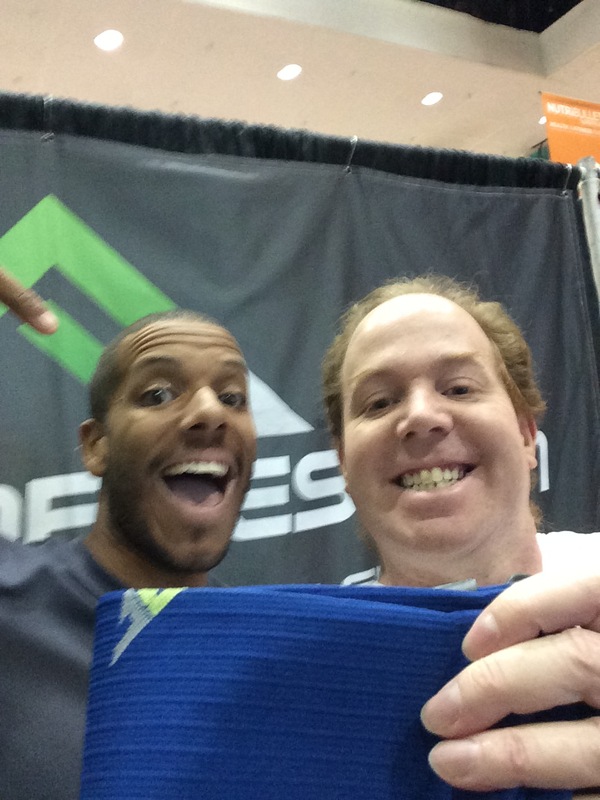 I purchased the Cliff Shot Bloks and Pro Compression socks. 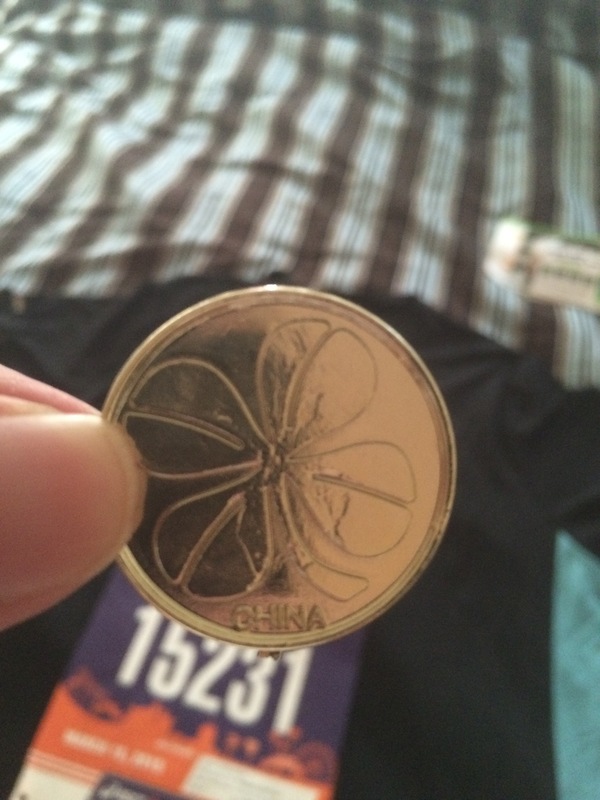 I’ve got to admit that the four-leaf clover plastic coin was pretty cool and I did carry it with me on race day! 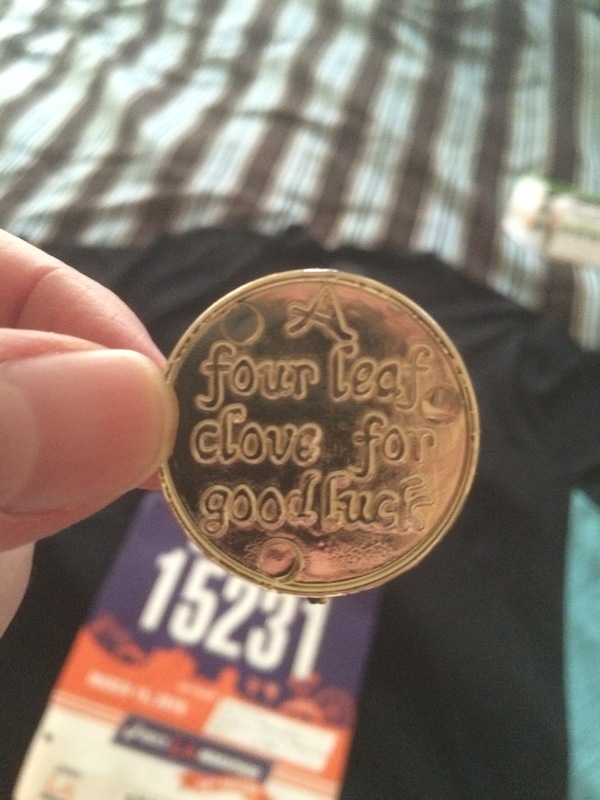 What a unique item to include in a race packet! 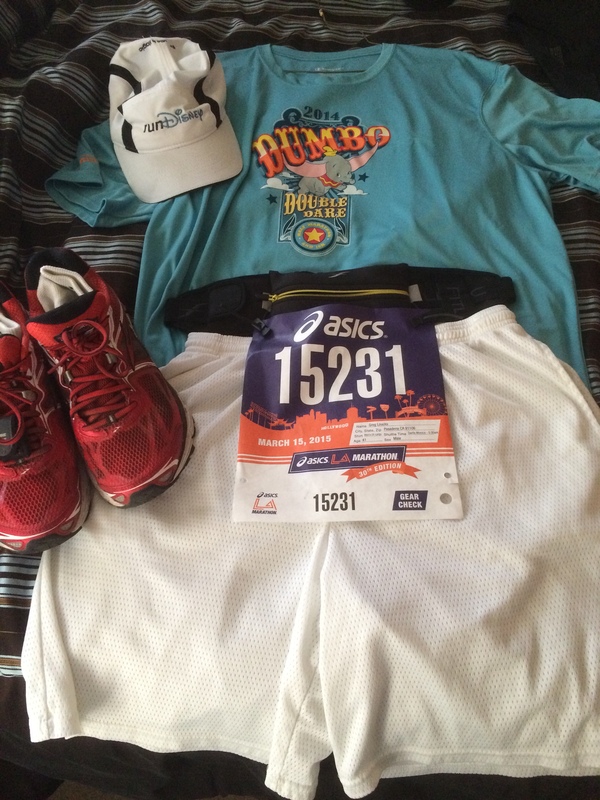 Once I got home, I put together my race gear for the next day. Here is “flat Greg” all ready to run a marathon! 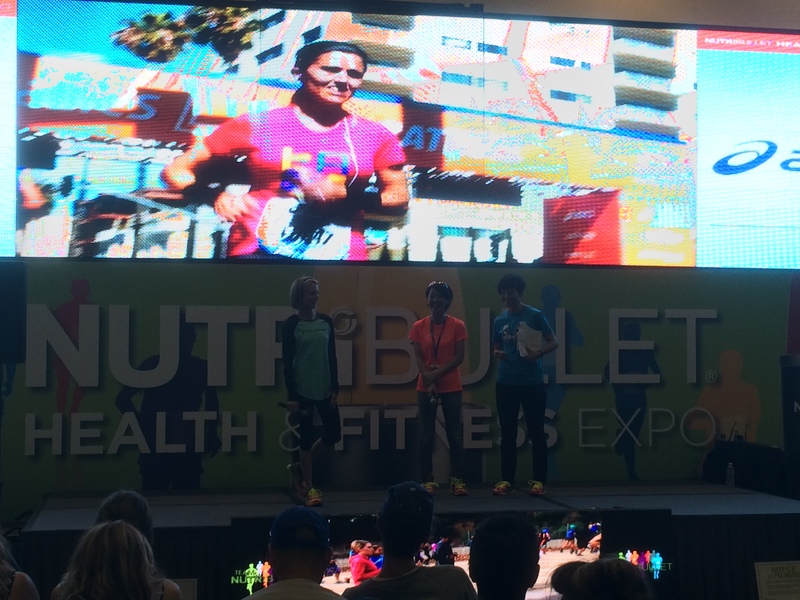 As you might be able to tell from this report, I had a blast at the NutriBullet Health and Fitness Expo! 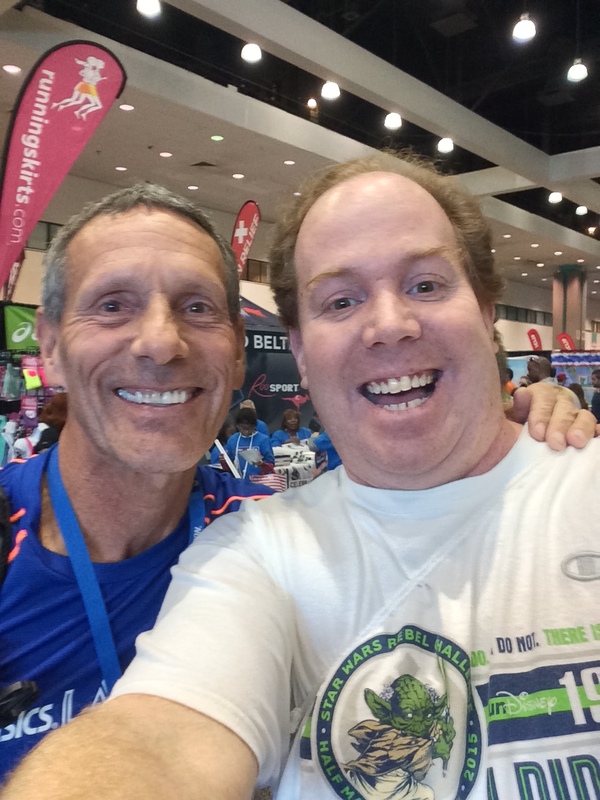 I got meet some more runners and hear their stories…always fun to hear! I got to see some other running friends! 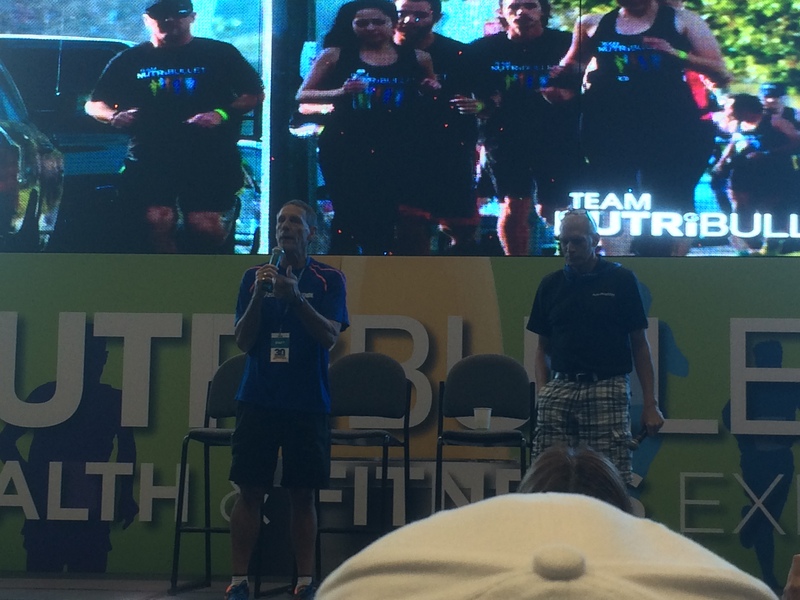 I got to meet Bart Yasso and Deena Kastor! There was lots of great information about training handed out by the speakers I sat and listened to! What is not to like? This Expo definitely inspires me to think about taking the time to listen to the speakers runDisney lines up for their expos. 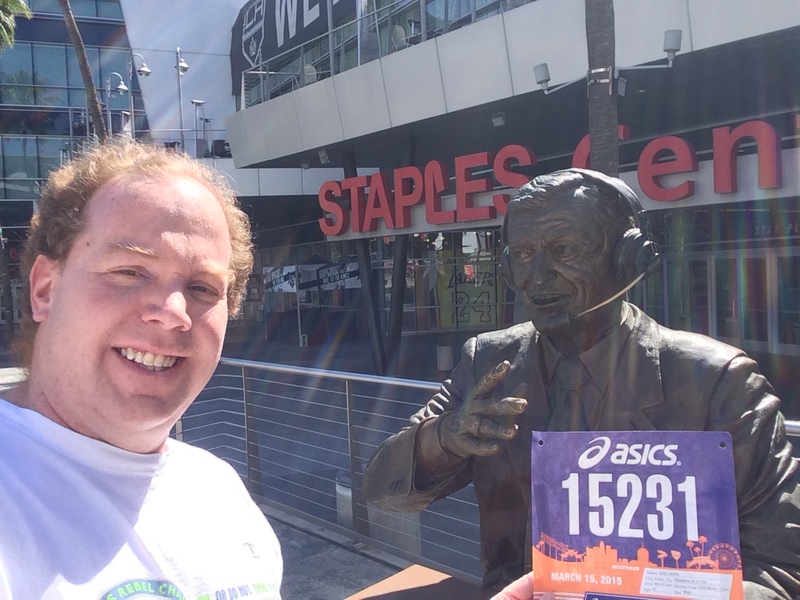 Come back tomorrow as I share part 1 (of 2) of my Los Angeles Marathon race! They do have the best information. I really enjoyed listening to the speakers that I got to see! Love the cover mock up. It’s a tradition when you work in magazines and newspapers that you get your own ‘cover’ when you leave, normally with worst photo possible of you and cover lines taking the micky out of stupid things you’ve said or done while you worked there. Your cover looks much better than mine! Interesting tradition. I had never heard that before. I was pretty happy about the way that picture turned out!